PanARMENIAN.Net - Nominations are open for the Aurora Prize for Awakening Humanity, a new annual international humanitarian award to be given to a person or a group of people who put themselves at risk to enable others to survive. From July to October, a designated portal on www.100Lives.com/Prize will allow individuals to submit nominations for candidates they believe have overcome great personal challenges to make an exceptional impact on preserving human life and advancing humanitarian causes, Asbarez reports. To evaluate the submitted nominations, the Aurora Prize has gathered together an acclaimed group of people to serve on its Selection Committee, including Nobel Laureates Elie Wiesel, Oscar Arias, Shirin Ebadi and Leymah Gbowee; former President of Ireland Mary Robinson; human rights activist Hina Jilani; former Australian Foreign Minister and President and CEO of the International Crisis Group Gareth Evans; President of the Carnegie Corporation of New York Vartan Gregorian; and Academy Award-winning actor and humanitarian George Clooney. All of them are accomplished in a diverse range of fields, but are united in their commitment to the principles of humanitarianism. 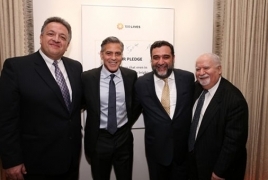 The Aurora Prize is the philanthropic vision of Vartan Gregorian, Noubar Afeyan and Ruben Vardanyan, the co-founders of 100 LIVES, an initiative expressing gratitude to the individuals and institutions whose heroic actions saved Armenian lives during the Genocide 100 years ago. 100 LIVES seeks to share remarkable stories of saviors and survivors and celebrate the strength of the human spirit. Together they are seeking to build a humanitarian movement by drawing attention to the issues faced by the world’s most vulnerable and reward individuals and organizations that work to address those issues in a substantial and consequential manner. The winner will be honored with a US$100,000 award, as well as a US$1,000,000 grant to be donated to a charitable organization that inspired their work. This is consistent with the spirit of the Prize and allows the recipient to continue the cycle of giving. Nominations may span a broad range of sectors in the non-profit field, including economic development, public health, law, government and education. Clooney will present the inaugural Aurora Prize to the winning recipient during a ceremony to be held April 24, 2016 in Yerevan, Armenia. Nominations can be submitted from July to October 1, 2015 at www.100Lives.com/Prize. The Aurora Prize has been developed as part of the 100 LIVES initiative, which is rooted in the inspiring stories of courage and survival in the Armenian Genocide. The Armenians who survived did so because of the courage displayed by others. A century later, 100 LIVES seeks to express gratitude, to share remarkable stories of survivors and their saviors, and to celebrate the strength of the human spirit. The actions of 100 LIVES will help to inspire others to stop, to think about those who have helped them during a crisis, and to express gratitude by doing something in return.